Being an artist, I value and see how powerful images are in society. As a writer, I see how important stories are to how we view ourselves and others. For so long and in so many ways, Indigenous people have been and continue to be marginalized in Canada. Sharing positive images and stories in a meaningful and respectful way, is a small, but symbolic step, to work towards addressing the damage of so many generations of systemic racism. Our view of Canadian history has been sadly skewed and Indigenous perspectives and contributions largely ignored. Having First Nations, Inuit, and Métis people featured prominently on our money would be a way to recognize the importance of Indigenous people in our society. It’s a way to change our media and mental landscapes that are generally bereft of positive Indigenous images. It would be a touchstone to share stories about the important impact Aboriginal people have and continue to have in Canada. I imagine parents having an instant teachable moment when kids ask who is on their dollar bills. I imagine visitors from other countries asking the same question, and Canadians proudly sharing stories about Indigenous historial figures and role models. I imagine a future where more Canadians talk about and see our country as starting with Indigenous people versus only when Europeans came here. I would hope this could help spark change in how our government, related agencies and every Canadian thinks about and relates to First Nations, Inuit and Métis communities. I started a petition asking the Bank of Canada and the Canadian government to feature First Nations, Inuit, and Métis people on Canadian banknotes. Below is a link to the petition. I am trying to collect as many signatures as possible to make this happen, so please sign and pass it on. I am overjoyed that the Canadian government has made the important and progressive move to feature Viola Desmond on our $10 bill. I am now petitioning the federal government to make a sincere and long-lasting commitment to feature Aboriginal men and women on our future bills. The Bank of Canada has said that its goal is to “promote Canada and Canadians – our values, culture, history, traditions, achievements and/or natural heritage.” There is absolutely nothing more Canadian than the Indigenous people of this land. It’s shocking and shameful that Aboriginal people are not included on every single bill we have. They are the heart and soul of this country, and their exclusion on our banknotes sadly reflects how our society has long viewed and treated First Nations, Inuit, and Métis people. When we think of “founding fathers,” we automatically think of white male government figures – and that is who we see on our bills. But this is not who “founded” this nation. Canada has always been home for Aboriginal people, for thousands of years and countless generations. Their culture, knowledge and connection to the land, and their willingness to share this, are what made it possible for Europeans to survive and thrive here. Aboriginal people shared a cure for scurvy with sickly newcomers, helped them travel this great land, and even taught them the sport of lacrosse which is enjoyed across the country today. From the very beginning to this very day, Aboriginal people have made and continue to make important contributions to Canada – that sadly have been and continue to be left largely unrecognized. The federal government can take action to help right this wrong; it has the power to make an impactful change. Ottawa can send a powerful message that touches all our lives every day, by meaningfully including First Nations, Inuit, and Métis people on our banknotes. Money passes through hands every day and across the nation, and who we see on our bills reflects how we see ourselves and how we see not only our past, but how we shape the present day and envision the future. By making Aboriginal people visible on our currency, this is a step in the right direction to illustrate how our government values and validates their importance in Canadian society. First Nations, Inuit, and Métis people should all be represented, with the goal of having historical heroes and/or present day role models featured prominently on Canadian banknotes. Some examples would be historical figures like Louis Riel and Molly Brant to present day trailblazers like Buffy Sainte-Marie, Rosemarie Kuptana and Senator Murray Sinclair. 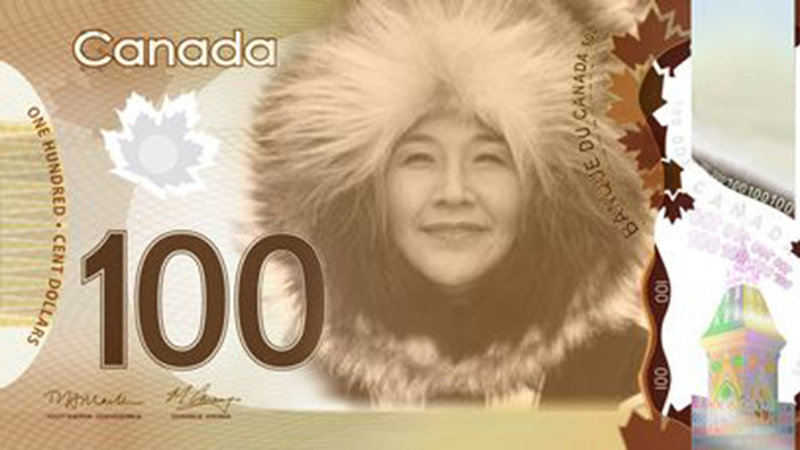 This petition calls on the Bank of Canada to commit to featuring First Nations, Inuit, and Métis people on banknotes, to do so as soon as possible, and to remain steadfast to this commitment as future bill series are created. Please add your name to help make this important change happen.